What can cure can kill, but can it also impart immortality? There is an adage in medicine that says: What can cure can kill. This is most often related to the dose given, but not always. Sometimes a medicine's best intentions are not realized, and the drug does not cure but rather kills the patient. This is the case with respected London physician Dr. Simon Bell. It's 1837 and he is faced with the imminent death of his beloved wife from breast cancer. The medical climate of those times yielded a sharp line of division between physicians and those who plied the apothecary trade, the ones who mixed up potions and poultices and other concoctions that the medical community felt had little scientific merit. But in his grief and fear, Dr. Bell steps outside the lines and approaches his old friend and apothecary Erceldoune Gaelan, begging him for help in saving his wife. Gaelan responds that he has an ancient text that contains just such a formula, but it is not without risk and must be carefully prepared and administered. Dr. Bell grasps the straw. After delivering the potion to his wife, she dies almost immediately. But miraculously her tumors seem to disappear. Distraught, Bell drinks the rest of the potion in the hopes of taking his own life. That is the beginning sequence in this fascinating story that spans nearly two centuries with the story predominantly jumping between 1837 and 2016. It seems the solution created by Gaelan from the ancient prescription imparts immortality—something both Bell and Erceldoune see as a curse. Gamelan has already fallen victim to its working and now so has Bell, locking the two men together for eternity. Bell only wants death so he can join his wife. The two men began a long and arduous search for the manuscript that has gone missing in the hopes that they can reverse this immortality curse. But in modern times, the chemical equivalent of the fountain of youth is a sought-after commodity. The huge pharmaceutical company Genomics wants the formula and the billions of dollars that would follow. Genomics geneticist Anne Shawe is on the trail, but after meeting Gaelan, a powerful attraction between the two occurs. And it seems that her family has a very strong connection to the missing manuscript. This is a wonderfully written and researched story with deeply drawn characters and more than enough action to keep the reader turning the page. It is at once an excellent rendering of old London and the state of medical practice at that time while also being a tense thriller. 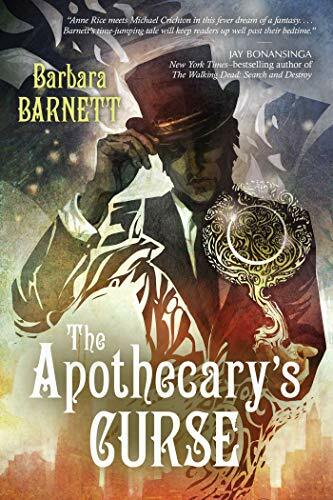 Barbara Barnett has written a clever and unique story and it is highly recommended. D. P. Lyle is the award-winning author of The Dub Walker series (Stress Fracture; Hot Lights, Cold Steel; Run to Ground) and the Samantha Cody thrillers Devil's Playground and Double Blind.